Cannabis enthusiasts love Diesels for at least two reasons: They give a superb, euphoric high that is energizing and uplifting and then there is their trademark flavour that blends classic aromas with their unique, fuel-like notes that many connoisseurs love. Zambeza’s NYC Diesel Autoflowering is the autoflowering variant of the superb NYC Diesel which makes this cosmopolitan strain easy to grow! Diesels have always enjoyed a huge following among cannabis enthusiasts. This is because Diesel strains shine with an eclectic yet superb taste together with a great upper high that makes these strains stand out among others. Famed NYC Diesel is what you could call a truly cosmopolitan and modern strain that just like New York City is full of bustling energy and that symbolises the diversity of “The Big Apple” with her mix of flavours perfectly. 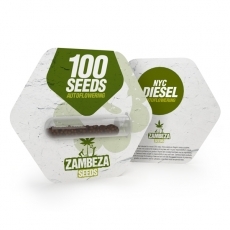 Zambeza gave their NYC Diesel autoflowering qualities by adding Ruderalis genetics. The outcome is a fantastic autoflowering Diesel that comes very close to the original. She has the same great taste and high and can also impress with some respectable yields. In a short life cycle of only 55-64 days, this sativa-dominant strain can yield as much as 350g/m² if you grow her indoors. Outdoors, she can yield a little more with up to 120g per plant if conditions are optimal. The plant won’t grow very tall. She will normally stay between 60-90cm indoors and even outdoors would rarely exceed a height of 100cm. This makes NYC Diesel Autoflowering a good choice if your growing space is limited or if you want to grow outdoors but would like to keep your grow hidden. Zambeza did a good job preserving the excellent qualities of the original with their NYC Diesel Autoflowering. With THC levels that have been measured a moderate 15%, her effect is not too overpowering but still potent enough that she will give a fantastic, energetic sensation of euphoria that gradually turns into a pleasantly relaxing body stone. This makes her a great smoke that you can enjoy during daytime but also at night if you want to chill. Like her bigger feminized sister, she brings the same classic Diesel aroma to the table, with fresh lemon notes and some subtle bitter tones nicely blended with her trademark tasty fuel notes. 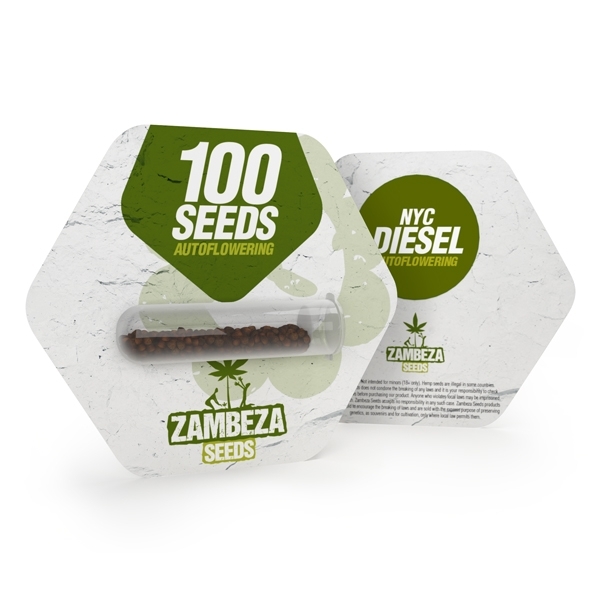 NYC Diesel Autoflowering by Zambeza comes as close to the feminized version as it can even get which means that growers can now enjoy a genuine NYC Diesel even if they have little experience with growing. For sativa lovers and those who love Diesels in particular, NYC Diesel Autoflowering can be a top choice if they are looking for a superb strain to grow. NYC Diesel Autoflowering bulk seeds are offered in packs of 100 seeds so that growers can stock up on this premium-quality autoflower.